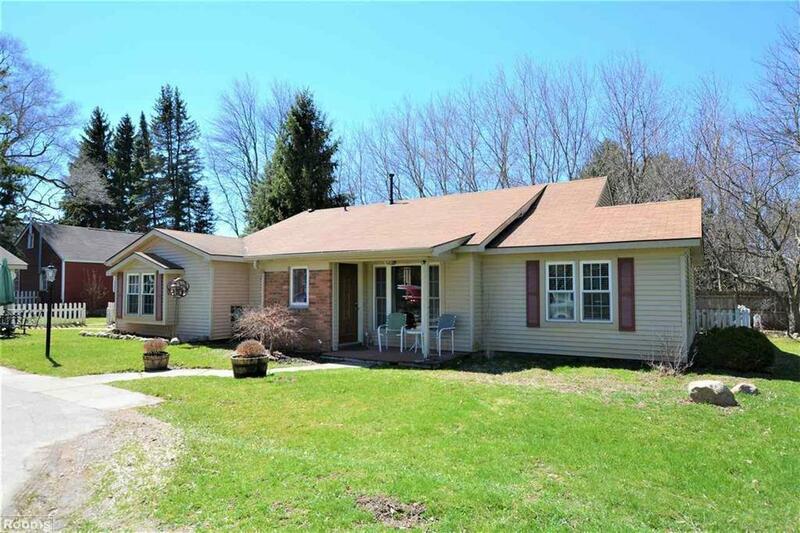 Quaint and Quiet country Ranch home! 4 bedrooms, 3 full baths. one of the bedrooms is at the opposite end of home with full bath and second living room with seperate entrance. New furnace and central air, Newer vinyl windows. Nice dining area off kitchen with beautiful built in china cabinets and wet bar cabinet. 2 out buildings - one is large 2 car garage plus attached 18 x16 office space area and 18 x 9 storage closet w/ built in shelves - perfect for a home business, craft room or workshop. The second building is 23 x 29 has a cement floor can easily hold 2 more cars plus workshop area and a loft. Home sits about 175 ft off the the road, enter lovely estate size property on winding tree lined drive. Watch the deer and other wildlife form your porch as you gaze at the beautiful trees and your nearly 3 acre homestead.